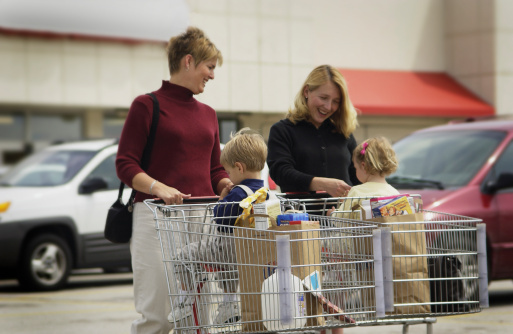 Before you head to the grocery store, develop a plan for what you need that week. Planning out weekly meals in advance can avoid impulsive food decisions when you are hungry. Making a grocery list and sticking to it will help your wallet and your waistline. Once you get home, organize all of your shopping. If you can prep ingredients ahead of time, you may able to cut down on time spent cooking during the week. Taking the time to organize your fridge and freezer will also keep you aware of food items that may need to be used quickly. Frozen fruits and vegetables are just as healthy as fresh, and they keep for a significantly longer time. Consider buying frozen, or if you know that you will not be able to eat your fruits and vegetable before they expire, find out how to freeze them. Many other foods can be frozen as well, such as bread and cheese. Using your freezer to its fullest ability can help you to save money by stocking up on foods when they are on sale, and reduce food waste by keeping food safe for longer. Most of us end up with a few items that get placed in the back of the pantry and never eaten. Consider donating to food pantries, food banks and food rescue programs. Both non-perishable and unspoiled perishable goods can be donated. Clean out your fridge, freezer and pantry every few months and support your local community. Composting is nature’s way of recycling organic materials back into the soil, and can easily be made with landscape trimmings and food scraps. Composting benefits your yard, saves money on fertilizer and is earth-friendly. If you do not have a backyard, there are still composting options available. If other people in your apartment building or community are interested in composting, perhaps find a community space to compost. 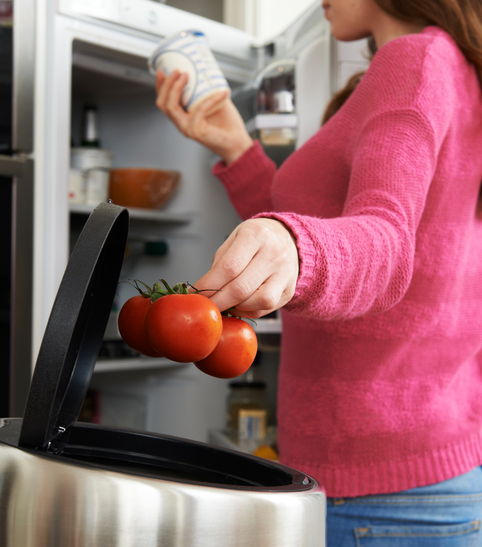 For more information about reducing food waste through planning and cooking, KareBoost Health’s registered dietitian nutritionist can help you to plan meals, create grocery lists, and provide healthy recipes. Are you looking for ways to move more outside of your regular fitness routine? Taking exercise classes and working out is fantastic, but when you are short on time or resources, adding more movement to your daily routine can make a big difference for your health. Here are five simple ways to move more during your daily routine. If possible, walk to more of your errands. Depending on where you live, driving or taking public transportation might be your only option, but you can park far away. Examine your routine and see how you can possibly add in more walking to the errands you already do. Always take the stairs instead of the escalator or elevator, if possible. Taking the stairs is a simple way to add in more movement without adding in a lot of time. You might even save time by not waiting for the elevator! Instead of picking up the phone or emailing a colleague, walk down the hallway and speak to them in person. On a phone call with a family member or friend? Instead of sitting and talking, slip on your shoes and head out the door. Those five or ten minute conversations can add up to serious movement throughout your day. If your work environment is open to ideas, suggest walking meetings instead of sitting in a conference room. Changing up the actual pace of the meeting might mean more alert colleagues and increased creativity. Already have a standing coffee date with a friend? Once a month, why not make it a walking date instead. Or switch out movie night with your significant other for a hike, walk in the park or dance class. Adding small movement breaks to your day can add a major contribution to your health. KareBoost Health is here to support you on your journey towards wellness. Come in, take a class or give us a call to find out how we can help you be healthier. The three types of fats present in foods are saturated fat, unsaturated fat and trans fat. To reduce your risk for heart disease, cut back on saturated fat and trans fat, and focus of unsaturated fat. Here is a primer on the three types of fats, and what to aim for in a healthy diet. Foods that contain saturated fat are often solid at room temperature, such as butter or the fat inside or around meat. Reduce foods high in saturated fat, like animal products. Leaner animal products like chicken breast have less saturated fat. Coconut and palm oil are also high in saturated fat. Unsaturated fat is often liquid at room temperature, and may be referred to as oil. Monounsaturated and polyunsaturated fat are both unsaturated fats. Unsaturated fat typically comes from plants sources such as olives, avocados, nuts or seeds but is also in fish, like Salmon. Trans fat is made from vegetable oils through a process called hydrogenation or can be naturally found in small amounts in some animal products. Look out for trans fat in cakes, cookies, crackers, icings, margarins and microwave popcorn. In general, limiting saturated and trans fat can reduce your risk of heart disease and improve “good” cholesterol levels. Look to replace foods high in saturated and trans fat such as butter, whole milk and baked goods with foods such as plants, fish, vegetable oils, avocado and tuna fish. Fat does have a place in a healthy lifestyle, and do not be afraid to include oil-based dressings, spreads, and avocados in your diet. 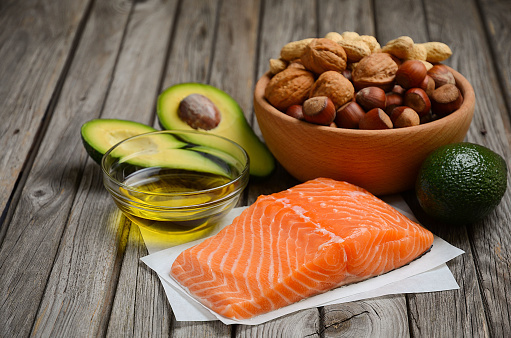 For more information on how to include healthy fats in a healthy eating plan, KareBoost Health’s registered dietitian nutritionist can help you decipher the myriad of nutrition information available and figure out a healthy eating plan that works for you.